So, Bracknell to Waterloo, there are several types of ticket, and lately they have started selling a first class off peak day return. This is not a lot more, and well worth it at some times of day as the trains get packets and first class has a table and power... Yay! Except the tickets rules make no sense, and clearly are so confusing even the staff at the ticket office do not understand. They swore that the 4pm to 7pm restriction did not apply to the first class tickets. The standard off peak day return can only be used after the morning rush hour (trains arriving after 10am at Waterloo). I rarely need to be in London for first thing, so this is good. However, for first class off peak day return there are extra restrictions. Yes, extra restrictions on the more expensive first class ticket. These are: "In addition, First Class Off Peak tickets are not valid if you board a train at: London Waterloo or Victoria between 1600 and 1900; Vauxhall between 1604 and 1904; Clapham Junction between 1607 and 1909. All times are inclusive, Monday to Friday. No restriction applies to journeys wholly with London Zones 1-6". So that means that I cannot use them to come back from London 4pm to 7pm, yet with the cheaper standard class ticket I can! But hang on, these rules are a tad odd. It seems that I can use the ticket to go Waterloo to Richmond as that is Zone 1 to 4. I can also use the ticket to go Richmond to Bracknell as that is not boarding a train at Waterloo, Victoria, Vauxhall or Clapham. 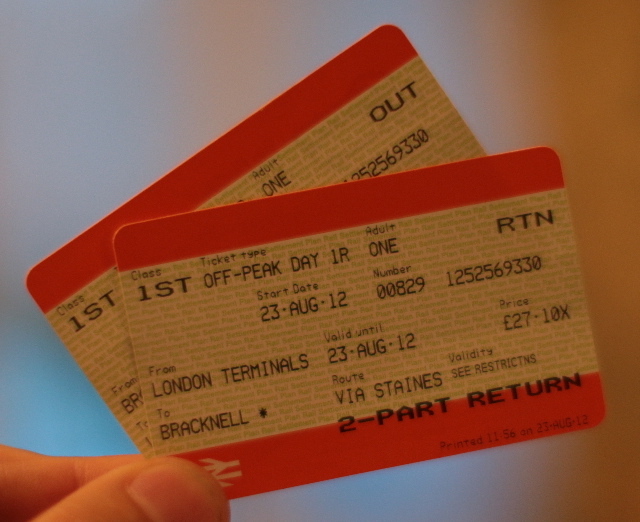 I am not allowed to use the ticket for one journey that goes from Waterloo to Bracknell (between 4pm and 7pm). Yet if I was challenged at any point on the journey my ticket could be valid. That must make enforcement a challenge for them surely. So, I wonder, what if I use the ticket in standard class Waterloo to Richmond, and if they query it ask if they can downgrade my ticket to a standard class instead of first class to allow me to use it? I suspect that would confuse the hell out of them. It makes no sense, of course! http://brfares.com/#faredetail?orig=BCE&dest=1072&rlc=%20%20%20&rte=735&ldn=0&tkt=FRX suggests that ticket (which is type FRX, First Class Off-Peak Day Return route "VIA STAINES") is restriction code US, and I can't find anything in restriction code US that prohibits return travel from WAT between 1600 and 1900 ?! Which leaves me wondering why the SWT web site and they ticket machines state the restrictions. What is the legally definitive answer I wonder?